The giant centre-delivery rake: Relying on six rotors and offering variable work widths between 10 m (32’10”) and 19 m (62’4″), Swadro 2000 from KRONE is the biggest machine on the market which brings you unsurpassed efficiency, very little maintenance and quickest changeovers as well as high transport speeds, great longevity and a maximum of operator comfort and on top covers up to 20 hectares (49.5 acres) per hour. The windrows produced by Swadro 2000 are about 30% shorter per hectare than those produced by a four-rotor rake. A 30% shorter windrow translates into fewer passes and an up to 15% higher output of the following harvesters. As such, Swadro 2000 presents the ideal machine for large-scale and contracting operations. The high-performance four-rotor centre-delivery rakes: Swadro 1400 and 1400 Plus from KRONE have four rotors that work at variable widths between 11.00 m (36’1″) and 13.50 m (44’4″) and easily achieve work rates of up to 13 ha (32 acres) per hour. These machines stand out for high capacity, quick changeovers, rapid travel, great longevity and easy use. Their enormous effi ciency makes Swadro 1400 and 1400 Plus very viable machines that meet the demands of contractors and coops. Raking nearly 20 metres (65’7″) into one double windrow, the three-rotor side delivery rake KRONE Swadro 1010 is the ideal match for a high-capacity precision-chop forage harvester. 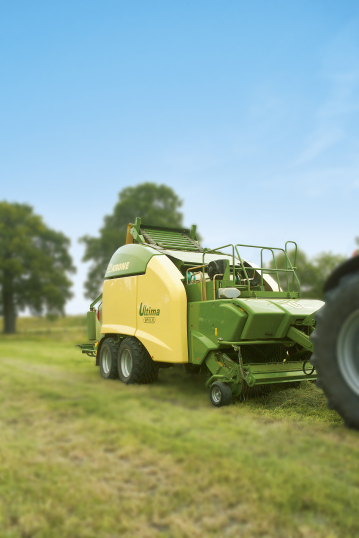 Offering stunning work rates of up to 10 ha/h, this machine is the performance booster of your harvest chain. Running on a wide wheel base and steered via an Ackerman system, this high-capacity rake offers an enormous agility and very easy maneuvering. It lifts the hay/straw leaving a well-aired and perfectly formed sward. This facilitates baling and provides a quality and nutritious fodder for lifestock. The Windrower is easily operated and is known to be a very reliable machine. The most complete, universal Haymaker available. Excellent job in spreading,tedding or windrowing. The Haymaker provides a high rate of performance and is very simply operated. It has a very sturdy structure which makes it a dependable machine.